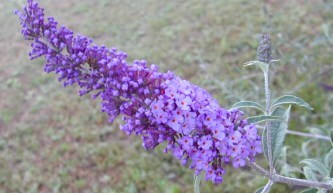 Butterfly bushes, sometimes called summer lilacs, are really butterfly airports. Their sweet, honey fragrance attracts butterflies and beneficial insects of all kinds. Dwarf Blue is one of the tidier butterfly bushes. However, the title dwarf is misleading because it is the leaves and the flowers that are small and not the overall size of the bush. Because the leaves are smaller the bush tends to grow a little slower and this slow growth creates a better formed shrub. While the other davidii's need yearly or bi-yearly pruning, this bush can be left alone to fulfill its growth potential. If you garden in zones 5 or 6, it will probably die back in the winter and you will prune it back to the ground like other butterfly bushes. Dwarf Blue Butterfly Bush is hardy to zone 5, tolerant of blazing hot sun, and able to grow in heavy soil with adequate drainage. Dwarf Blue Butterfly Bush is not really blue either. But, it must have a touch of blue in it because it goes well with pinks like our Magic Carrousel Miniature Pink Roses. This plant is sometimes available in plug trays. These trays hold 128 of all the same plant. They are a great low cost way to fill a lot of space. Each cell is 3/4 of inch by an inch. Check here to see if Dwarf Blue Butterfly Bush Plug Trays are available. Dwarf Blue Butterfly Bush is one of the six plants chosen to be in our Wildlife Herb Garden Six Pack.